Brooklyn Bridge Animal Welfare Coalition, Inc. Pretty Pistachio was a hard working mama cat for years! She lived at Brooklyn Heights bodega and was matriarch of a long lineage of adorable kittens -- until the bodega owners FINALLY allowed us to rescue her and her children. Pistachio is now spayed and looks forward to never giving birth to or nursing another kitten ever again! 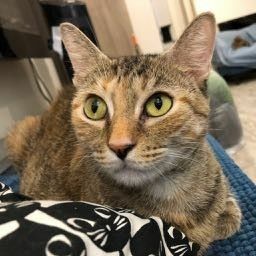 She is pretty chill (although does enjoy a bit of catnip) and would prefer to have a home all to herself, although she wouldn't mind cohabiting with another respectful adult cat. Not what you were looking for? You can adopt a different pet in Brooklyn by using our search feature and adjusting the radius. Thank you for helping our animal shelters and rescue groups with pet adoption! Our rescue group was formed in December 2007, but all our Board Members have had extensive experience rescuing and working with abandoned animals. We often work with other rescue organizations to find appropriate and safe foster and adoptive homes for our pet clients. We regularly go to areas with abandoned animals and collect them. The animals are taken to a licensed veterinarian examined, treated and spayed or neutered. Every effort is made to work with the animal and our foster and adoptive families to find a suitable forever home. For those animals who are truly wild and feral, we release the animal in a safe and secure location after it has recovered from its medical treatment. We also work with certified wildlife rehabilitators to rescue injured and orphaned wildlife. Our organization is focused on improving the welfare of the abandoned animals in need of help in Brooklyn. In furthering that goal, our resources are focused on the animals. Aside from a few minimal overhead costs such as our website and phone services, our entire budget is spent on animal care such as medical and food costs.